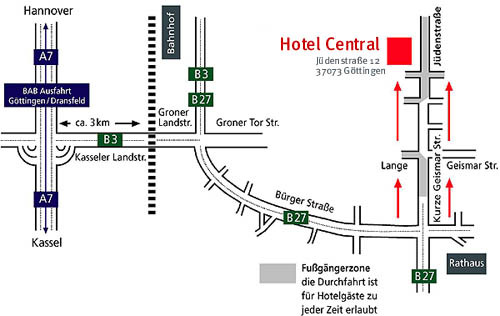 In our sketch we have marked the route to Hotel Central within Göttingen for you. You come from the Autobahn 7 – Göttingen Exit (no. 73) or from the highway B 3 or B 27 to us. Important information: If you are using navigation system, please enter "Kurze Geismarstgraße" as your destination (Note: In its further course the Kurze Geismarstrasse becomes the Jüdenstraße). When you reach your entered destination, continue driving straight on until you reach Hotel Central (on the left side of the street). Please leave the autobahn at the Göttingen/Dransfeld Exit (No. 73). Drive into the city in the direction of ‘Zentrum’ (city centre) (four-lane street: Kasseler Landstraße turns into Groner Landstraße, ca. 3 km). At the junction Groner Landstraße/Berliner Straße turn right onto the inner-city ring road, Bürgerstraße. This street circles the inner city for several kilometres. Don’t let the numerous traffic signals and crossings get on your nerves. At the first place with a left-turn lane (after approx. 1.5 km), turn left into Kurze Geismarstraße and continue into the inner city. In its further course, the Kurze Geismarstraße turns into the Jüdenstraße. You will know that it’s time to turn left when you see the Volksbank building (on the corner to the inner city) and a high-rise building (Neues Rathaus = new city hall) to the right beyond the intersection. Please note that as a guest of Hotel Central you have the right to drive through the pedestrian zone to the hotel at any time. There are corresponding signs at the beginning of the pedestrian zone, which allow hotel guests to drive through. In each case, drive to the inner-city ring road via the Bürgerstraße and then further as described above. Exception: When you approach the city from the direction of Friedland on the B27, continue to drive straight on into the Jüdenstraße. Arriving by train is also comfortable and problem-free because the Göttingen train station is an ICE stop and only 10 minutes from the hotel by foot. When you leave the train station’s main entrance, you cross the street via the traffic-light-controlled pedestrian crossing (Pelican crossing) to reach the Goetheallee on the opposite side. Continue straight on through the Prinzenstraße to the Theaterstraße. The latter intersects the Jüdenstraße. Turn right into the Jüdenstraße. Our hotel is on the right side about 200 meters from the intersection.